In this last article we explained the home screen components of VIENNA Advantage POS back-end system. In this article we will focus on the Organization Structure, Warehouse and Replenishment Rules in VIENNA Advantage Retail & SCM Industry Template. VIENNA Advantage supports complex organization structures with hundreds of stores, warehouses and legal entities. These complex organizations are typical of large and international chains of retail stores. To access the organization management panel, navigate to the home screen > click on the Applications Menu button > Type “Organization” in the search bar and access the menu. In this panel you can define different criteria such as, regions, sub-regions, cities, stores… and for each region you may define different warehouses that would supply pre-defined stores. In this way you can have a structured view of your organization and can easily access, manage and store data. 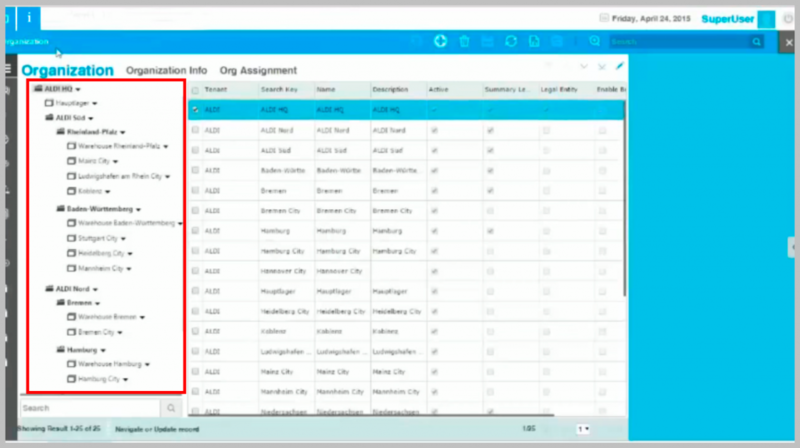 Vienna Advantage Retail & SCM Industry Template, transforms complex supply chains to simple and comprehensive data, easily accessible and manageable. To learn more download brochure. You can even use VIENNA Advantage to set up a franchising model of stores, since you can define a particular store as an organization and then set up its own accounting rules and settings. In the picture below, you can see quite large organization tree. Several regions and sub-regions are created, and under each region / sub-region there are stores and warehouses. There is no limitation to the number of stores and different categories (regions, countries, cities) you create in our system. Each store has at least one physical warehouse and two warehouse entities in the system. But VIENNA Advantage POS allows you to create as many warehouse entities as you like, in the system, depending on different criteria. For example, you can create two warehouses depending on the flow of the goods. One for the forward-flow (sales) and another for the backward-flow (returns) of the goods. This is a usual need for every retailer, because no one wants to mix the returned items (damaged or with expired date) with the items which are good for sale. In the picture below, you can see the basic info that each warehouse entity in the POS system provides. 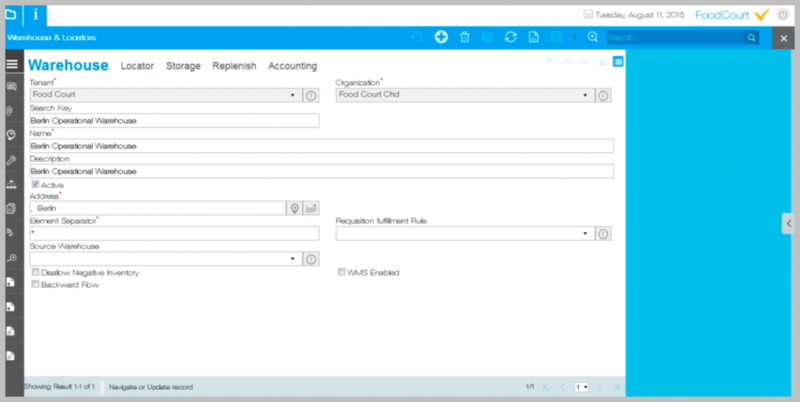 You can define specific rules for each warehouse such as accounting, replenishment rules and other rules. 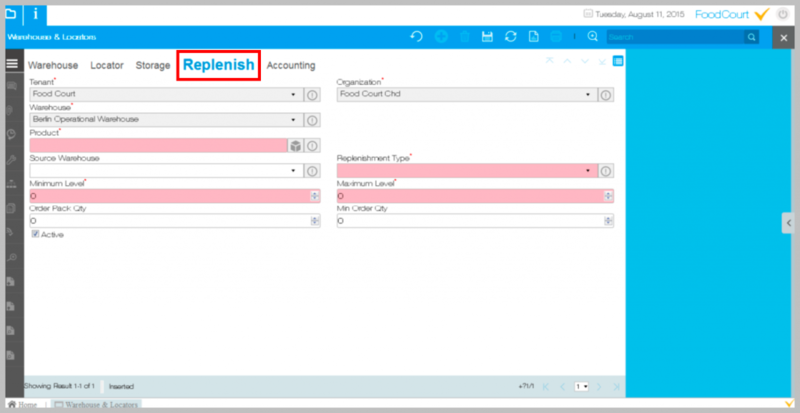 To define replenishment rules navigate to the home screen > click on the Applications Menu button > choose the “Warehouse & Locators” App from the drop down list. A new window will open from where you should choose the “Replenish Tab”. Once you access this tab you can appoint replenishment rules to each product in you warehouse. For example you can set up minimum-maximum stock level and then choose a replenishment strategy (type). See picture below. Reorder below Minimum level is a replenishment rule that will make an automatic order whenever the stock is below the minimum levels. To automate the replenishment process, the user should first enter parameters for “minimum order quantity” and “order pack quantity”. Maintain Maximum Level is a replenishment rule where the system will always tend to maintain the maximum level of stock that has been set up by the user or the administrator. Whenever an item is sold, damaged or date has expired, the system will make an automatic order to maintain the replenishment rule set by the user. The user / system administrator may also choose to create custom replenishment rules. Get regular updates about latest blog releases and special offers! Subscribe Now!